I had heard a lot of good things about Grace, so I figured it was time to try the place out. Given that the restaurant is celebrating its five-year anniversary this year, they must be doing something right, right? The interior decor is contemporary yet comfy, with interesting angles and fascinating fixtures. But at the same time, the space was much larger than expected, and thus felt cavernous rather than cozy. 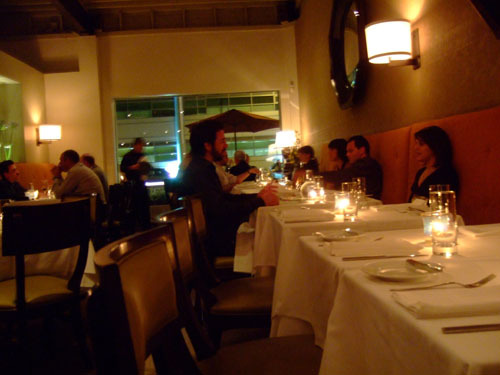 Grace offers à la carte selections as well as several tasting menus. 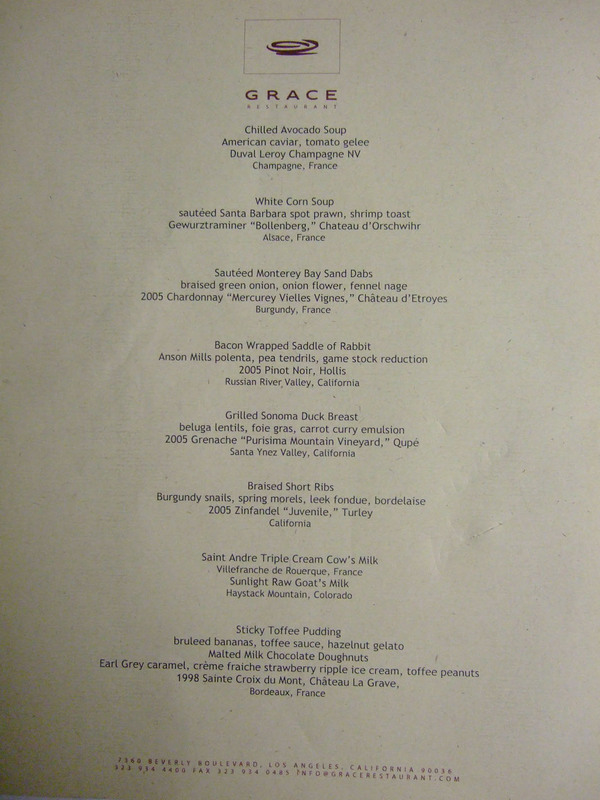 However, we were here for the Chef's menu, which is created by Chef Neal Fraser a la minute. Normally, the Chef's menu consists of seven courses; however, we requested the addition of a cheese course (which we weren't charged for), making it an octet. Since the Chef's menu is determined on the spot, we requested that the dishes and wine pairings be typed up. Click for a larger version. 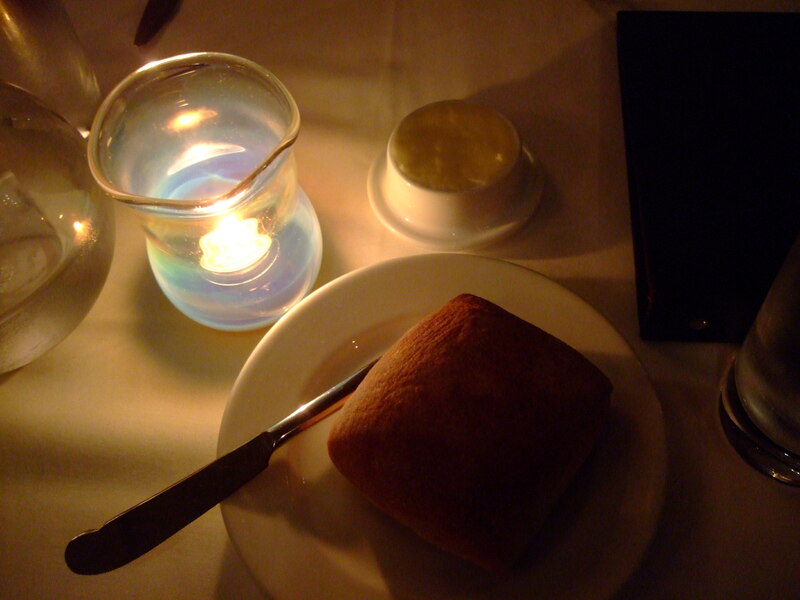 A ciabatta style loaf was the sole bread offered. I thought it was a bit hard (though certainly nowhere near the level at Veritas), but my dining companion liked its crustiness. The butter was excellent: smooth, spreadable, and salty. To start? 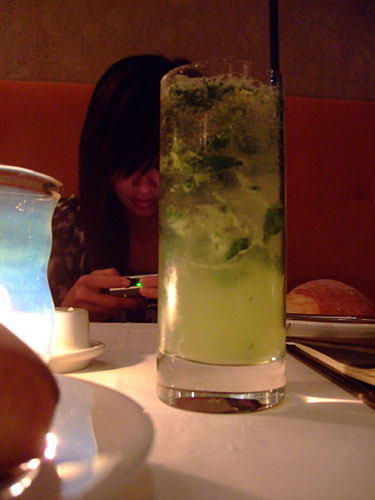 Why a mojito of course! This was a fine example, nicely balancing the drink's sweet and strong elements. 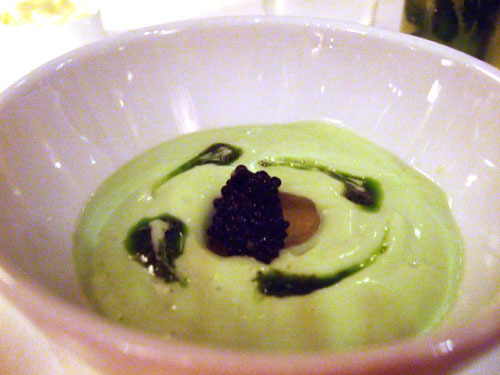 American Caviar, Tomato Gelée. The first thing I thought of when I tasted this was "guacamole." 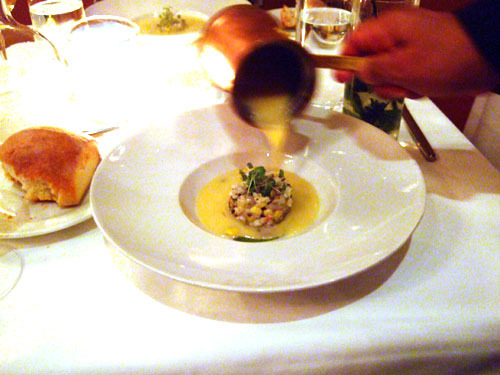 The soup was mild and refreshing, with the tomato gelée adding a touch of sweetness while the caviar provided a perfect salty foil. However, I felt that the volume of avocado soup was simply too much, and overwhelmed the various accoutrements, thereby becoming a bit too monolithic in taste and texture. The paired Champagne went nicely with the theme of this dish. Sautéed Santa Barbara Spot Prawn, Shrimp Toast. Though I normally dislike corn soup, I thought this was excellent. 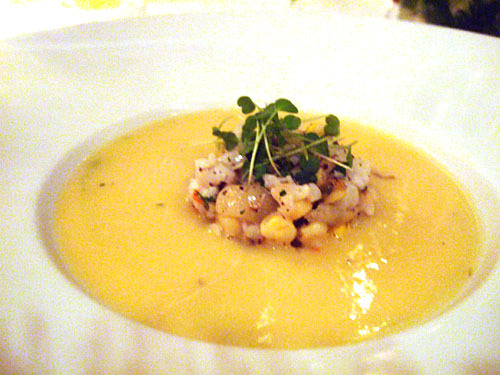 The corn didn't drown out the prawn like I was afraid it would; rather, the two played different, but complementing roles in the dish. 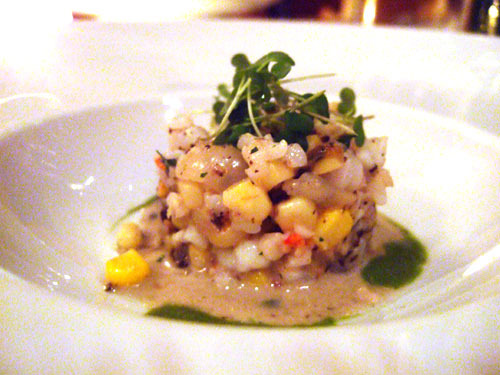 The included Gewurtz had a slightly Riesling-esque sweetness to it, which I thought linked nicely with the corn's inherent sweetness. Braised Green Onion, Onion Flower, Fennel Nage. I think this may have been my first experience with sand dabs. 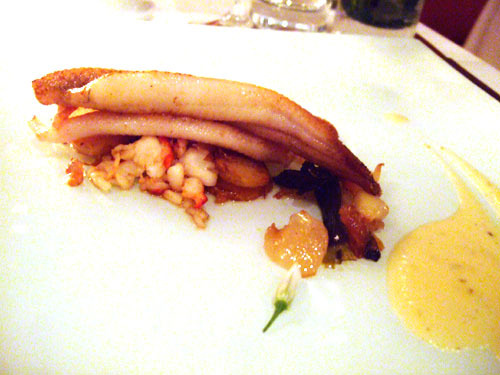 The fish had a subtly sweet, soft, moist flesh that I actually wasn't huge fan of consistency-wise. I did enjoy the flavor of the fish though, along with all the various accompaniments, which provided a much needed contrast in texture. I thought the paired Burgundy was relatively subdued for the region, and proved to be a competent pairing. 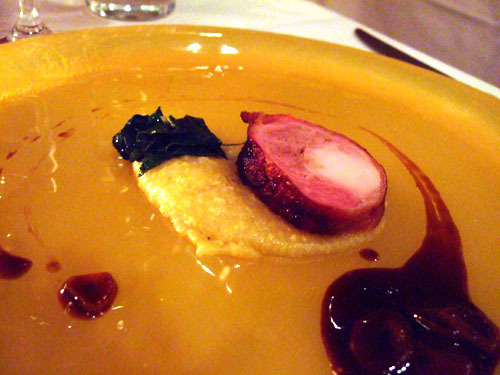 Anson Mills Polenta, Pea Tendrils, Game Stock Reduction. Perhaps due to the bacon wrapping, the rabbit almost had a hammy taste to it, and texture-wise it wasn't too far off either. In any case, the flavor was intense, bold, with a touch of smokiness, and quite delicious actually. 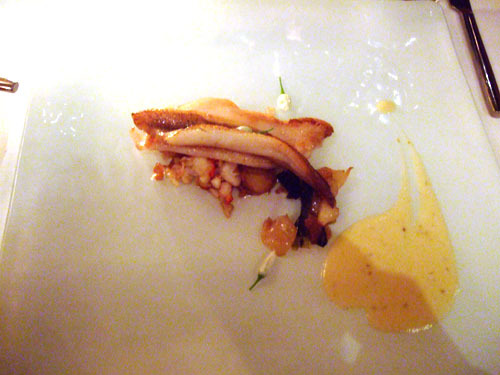 We had both the Pinot and the Grenache (for the next course) presented to us with this course. Given the intensity of the rabbit, the Grenache was probably a slightly better fit. Beluga Lentils, Foie Gras, Carrot Curry Emulsion. I thought the foie was quite good, one of the better sautéed versions I've had in a while actually (I prefer the terrine style generally). 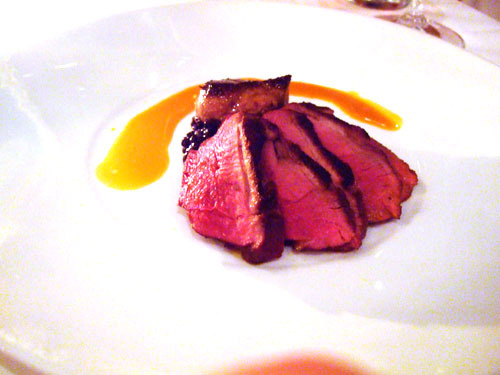 However, the duck itself was tougher than I like, and I didn't think the flavor was robust enough. Duck and Pinot is a classic pairing, and I felt it worked a bit better than the Grenache in the side-by-side comparison we had. 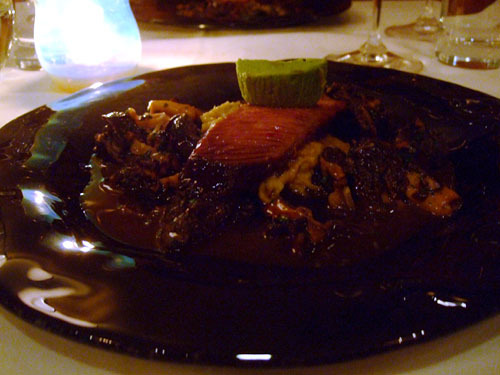 Burgundy Snails, Spring Morels, Leek Fondue, Bordelaise. 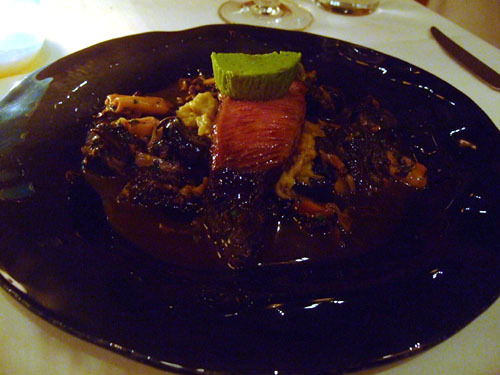 Braised ribs are usually incredibly tender and succulent (e.g. at Bastide, Michael Mina, or Valentino), yet unfortunately, that wasn't the case here. The ribs were surprisingly tough, and not particularly flavorful. Disappointing. The snails, cooked in a classic Bordelaise sauce, were quite good though. Zin was a wise wine choice here. 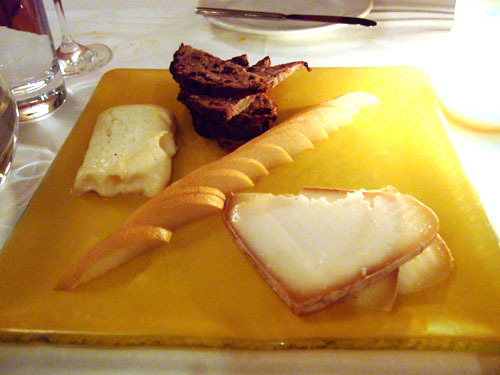 • Saint Andre Triple Cream Cow's Milk, Villefranche de Rouerque, France - Being a triple cream cow's milk cheese, the Saint Andre reminded a lot of one of my favorite cheeses, Brillat-Savarin. Soft, rich, and buttery, it was particularly tasty when spread on the toast. Superb. • Sunlight Raw Goat's Milk, Haystack Mountain, Colorado - This semi-hard cheese, on the other hand, with its fruitier and nuttier flavor, went better with the pear. Quite good as well. 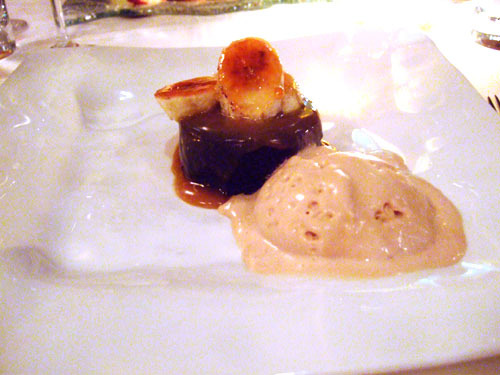 Bruleed Bananas, Toffee Sauce, Hazelnut Gelato. The stickiness of the pudding put a nice twist on an otherwise pedestrian chocolate dessert. The burnt bananas were also a nice touch. Earl Grey Caramel, Crème Fraiche Strawberry Ripple Ice Cream, Toffee Peanuts. 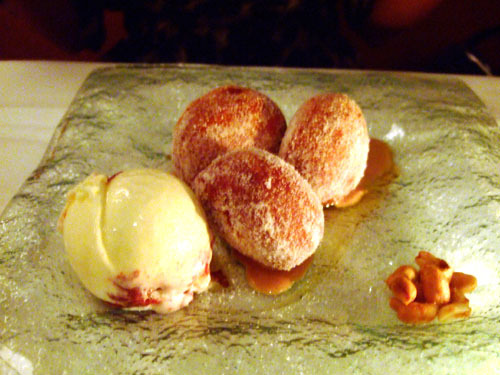 Grace is known for its doughnuts, and they didn't disappoint here. Their complex flavor paired perfectly with the caramel sauce; and the strawberry ice cream, with its bits of fruit mixed in, was quite delicious as well. I wasn't as impressed with Grace as I thought I'd be. They were some strong courses indeed, but overall, the dishes lacked the finesse I was looking for; portions were also larger than I thought they should've been. The order and arrangement of the courses seemed a bit off as well, and we didn't receive any amuse to begin the meal nor any mignardises to close it. That's basically how I felt about the meal in general: incomplete. Nice review Kevin. 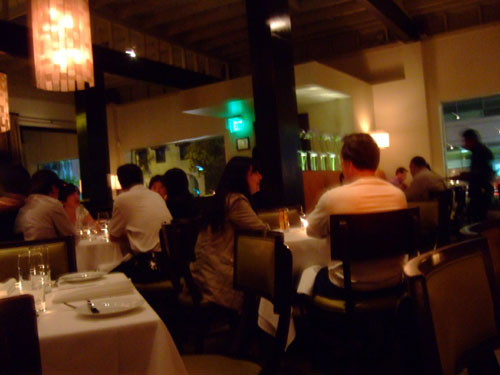 Good to see that I wasn't the only person in LA with a so-so experience at Grace (I really wanted to like it, too). 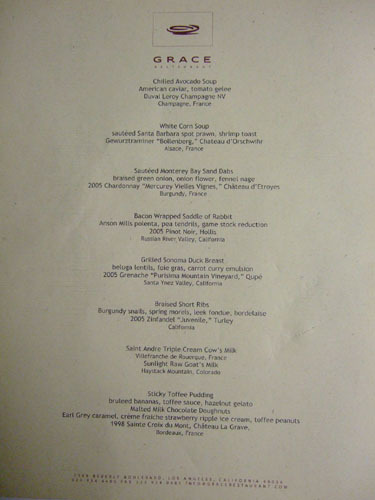 Just seems weird that their Chef's Menu (supposedly the best way to get access to Chef Fraser's dishes) fell short on your visit and mine (http://exilekiss.blogspot.com/2008/06/grace-restaurant-underwhelming-review.html).